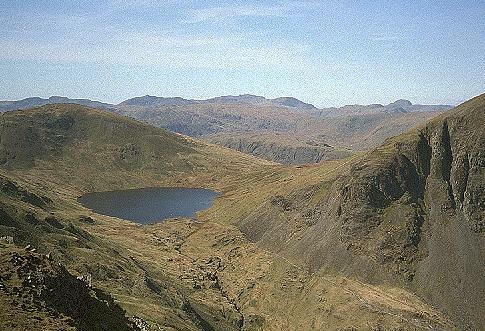 Grisedale Tarn nestles between Fairfield (off the left of the picture), Seat Sandal (beyond the tarn on the left) and Dollywagon Pike (on the right). It is in a sheltered location providing a pleasant wild camp site on its western shore. On the horizon are, from the left: Crinkle Crags; Bowfell; Scafell, with Esk Pike in front; Scafell Pike; Great End; three tops of Glaramara; and Great Gable.